Always attention to detail, technical skills, passion in our work and great attention to customer needs are the strengths that have allowed us to excel in the field of sale of Airbrush Kit "STARTER KIT ARISM" for modeling. Consultando il catalogo di Aerografando you will immediately notice how vast it is and how diversified the model range is Modelling, you will find the best Airbrush Kit "STARTER KIT ARISM" for modeling offers at the best prices on all Airbrush Kit "STARTER KIT ARISM" for modeling of the brands Aerografando. With a sleek and modern design, Arism is aimed at airbrush enthusiasts and artists looking for the compact, yet powerful, light weight compressor for airbrushing. When paired with the airbrush bleed valve and SilverBullet airbrush moisture trap, users are presented with a combination of greater airflow control and an extended handle on the airbrush for comfort and relieving muscle tension. A novel and effortless approach to cleaning your airbrush(es). Simultaneously acts as a holder and allows users to clean their airbrush by spraying the excess color into the pot, eliminating overspray. Simply rinse out the pot after use. Packaged inside a 700 cc protective plastic container which can be used to store paints when not in use, this portable and sleek design is one of our most popular accessories. Premium RC is a line of water-based acrylic paints, developed specifically for aerography. They are suitable for a wide range of materials and surfaces. They adhere perfectly to metal, fiberglass, polyethylene, Lexan / polycarbonate. Ideal for model cars and for all applications in tuning and automotive. The polyurethane primer (62.601) helps on the most difficult surfaces. The Premium RC colors are exceptionally flexible and durable and provide excellent sealing when exposed to the sun or atmospheric agents. They have been formulated with very fine and resistant pigments; the base is admixed with polyurethane resin that prevents surface tension, chipping and breakage, resistant to external agents, heat and possible fuel residues. Premium RCs have a fluid delivery and can be easily applied. They can be used pure with 0.3 mm nozzles. For metallic colors and finer nozzles (0.2 mm) an addition of diluent (62.068) is suggested. Compressor pressure between 2 and 4 bar is recommended. The range consists of 20 bright opaque colors, 23 metallic and fluorescent colors and 9 Candy colors. All colors lend themselves to very fine details and large backgrounds and can be applied indifferently with the plane and the brush. 8 auxiliary products are provided, to be used as endings, bases, retarders or diluents. For motor vehicle applications, protective treatments with a catalyzed urethane end (with airbrush or can) are always suggested. The package contains n. 3 bottles of 60 ml each in the colors: yellow fluo (62031), blue fluo (62038), scarlet fluo (62034). Read the reviews of our customers on Airbrush Kit "STARTER KIT ARISM" for modeling of the category Modelling. With us you will find only satisfied customers, thanks to a technical assistance made by those who really know the world Modelling. 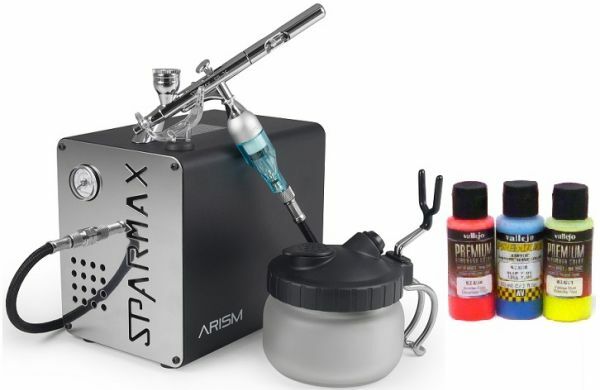 Review Airbrush Kit "STARTER KIT ARISM" for modeling of the brand Aerografando. Trust in the quality and professionalism of Aerografando on the sale of Airbrush Kit "STARTER KIT ARISM" for modeling, only from us you will find the best prices. You want to have more details on Airbrush Kit "STARTER KIT ARISM" for modeling ARISMmod or more generally on ours Modelling? You are looking for a Modelling but do not you find it in the catalog? Staff of Aerografando will answer all your requests.